“Low Vision” is a term you may hear a lot in the elderly population. What is low vision and what does it really mean? 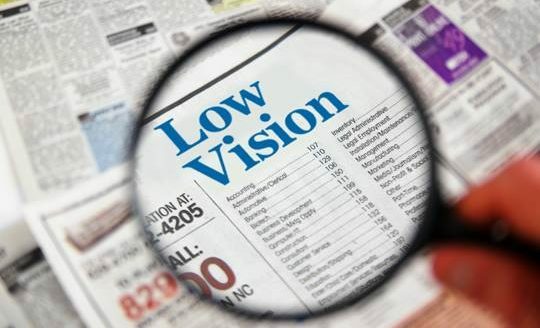 Low vision is a reduced level of vision that cannot be completely corrected by glasses, it usually affects a person’s performance of daily living activities, and it is not a natural part of aging. Low vision is different from blindness in that a person with low vision still has some useful sight. According to the Kellogg Eye Center with the University of Michigan Medical School, 17 percent of people over the age of 65 are either blind or have low vision. Because low vision is not a natural part of aging, its cause is usually an eye disease such as macular degeneration or glaucoma. Low vision is one of the reasons people move to assisted living. Receiving assistance with transportation and daily living activities can really increase a person’s quality of life and decrease their stress level. Increase contrast wherever possible. For example, if a person’s bathroom counter is white, purchase a dark colored soap dispenser, hair brush, tooth brush, or whatever is left out on the counter. If the walls, outlet covers, and light switches are all light colored, purchase dark colored frames and install them around the light switches and outlets. If a person has a dark colored table and dark colored dishes, purchase light colored placemats to help distinguish the plate from the table. Exchange small print for large print or talking devices. Replace a small cordless phone with a low vision phone that has amplified numbers. Change the standard wristwatch out for one that will speak the time with the push of a button. There are even talking kitchen gadgets to help a person get around in the kitchen better. If large print is not an option, place magnifying glasses around the house for easy access. If your low vision friend used to enjoy reading, set them up with talking books. The Colorado Talking Book Library is a free service to those who are unable to ready standard print materials due to different disabilities, one of them being vision. Visit their website, www2.cde.state.co.us, for more information and to sign up for their free services. Alleviate changes in light. Walking from one room that is lit mostly by artificial light to one that is lit by natural light is really hard for a person’s eye to adjust. Put blackout curtains in the windows to minimize glare upon entering the room to avoid disorientation and difficulty seeing. The blackout curtains makes adjustment when walking into a room take less time, is less painful, and is smaller. It is best to use daylight, full spectrum light bulbs. Making a few easy adjustments to a person’s living environment can make a huge difference in their ability to stay independent. Loosing your vision is hard to deal with. Any help that can alleviate a low vision problem just a little bit can greatly increase a person’s quality of life.